When you import a book into Kindle Create in DOC OR DOCX format, your file is converted to a "reflowable" eBook, which allows the reader to resize text and is available on all Kindle devices and free Kindle reading applications. Kindle Create works with several word processing applications (e.g., Microsoft Word, Apple Pages, Google Docs) that export to the DOC(X) format. After installation, you can launch Kindle Create by selecting Windows key > Amazon > Kindle Create (Windows) or Launchpad > Kindle Create (Mac). Kindle Create has limited support for tables, lists, footnotes, indents, and hyperlinks. They can't be edited. If your book contains any of these content types, please preview them before making major changes in Kindle Create. You might need to return to your primary authoring tool (e.g., Microsoft Word, Apple Pages, or Google Docs) to make changes and then re-import the document. On the Kindle Create launch screen, click the New Project from File button. You can also launch a new project by selecting File > New Project or using the shortcut CTRL + N (CMD + N for Mac users). The Choose File dialog box is displayed. Click the Novels, Essays, Poetry, Narrative Non-Fiction option. Click the Choose File button, navigate to the DOC(X) file on your local hard drive, select the file, and click Open. 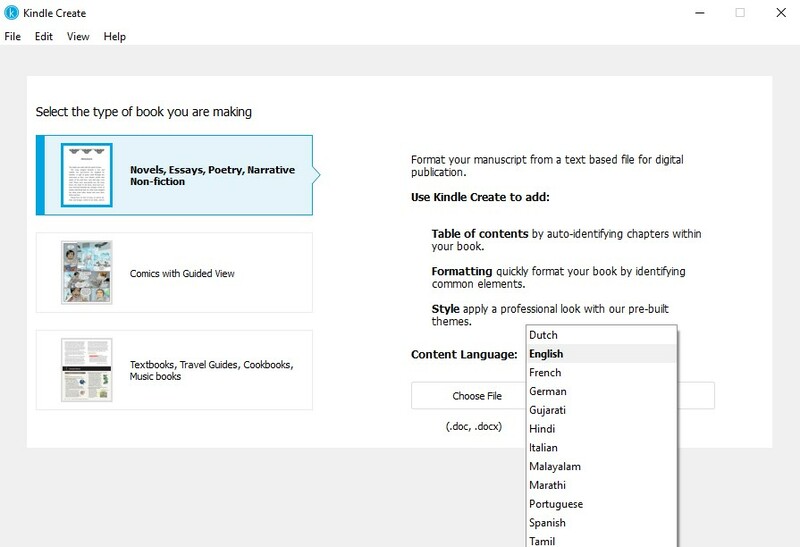 After you choose a file, Kindle Create begins converting it to a Kindle eBook. Conversion optimizes font faces, line spacing, margins, indents, and other typography features to improve reading on electronic devices. It also converts every page break in your DOC(X) file into a new section. While your file is imported, Kindle Create displays rotating screens that tell you more about Kindle Create. When conversion finishes, the Import Successful dialog box is displayed. Click the Continue button. The Automatic Chapter Titles dialog box is displayed. Click the Get Started button and Kindle Create begins finding potential Chapter Title elements in your eBook. 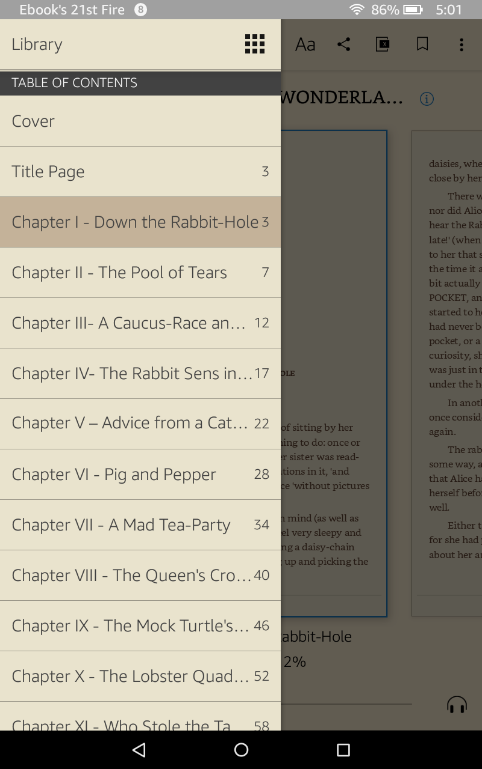 The Suggested Chapter Titles dialog box displays a list of possible chapter titles. 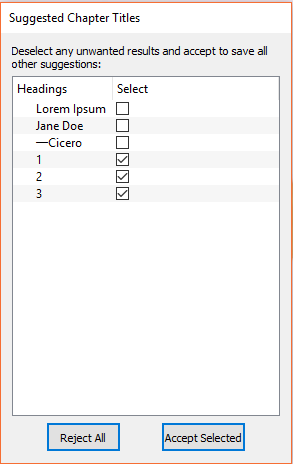 Uncheck any items that are not chapter headings and then click Accept Selected. The checked items will be part of the Kindle Interactive table of contents. From this dialog box, you can also click a chapter heading to go to that section and apply formatting while keeping the Suggested Chapter Titles dialog box open. Choose File > Save Project to save your imported eBook. The Save Your Project dialog box opens. Accept or change the file location and name, and then click Save. A table of contents is important for a good reading experience. It allows a reader to navigate between chapters easily. As part of conversion, Kindle Create detects possible chapter titles and displays them. After you revise and accept the entries, they're used to create two types of TOCs, the TOC page and the Kindle Interactive TOC. The TOC page (also called an HTML TOC) is a page in the beginning of your book that includes links to each chapter of the book. 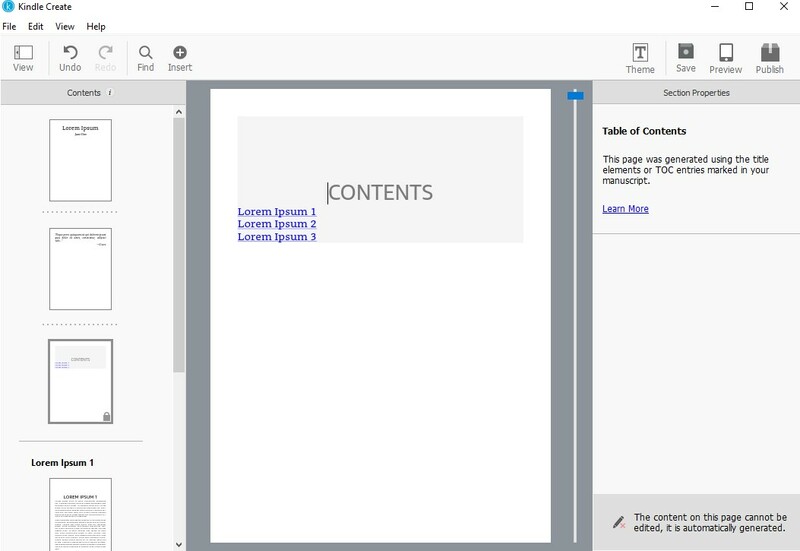 If your document includes a Microsoft Word TOC, Kindle Create converts those TOC entries to hyperlinks as part of creating a TOC page in your book. To add a TOC page, click the thumbnail of your first chapter in the Contents pane and choose Insert > Table of Contents. The list of detected chapter titles is displayed. Click OK to accept it and the TOC page is added to your book. The TOC page is automatically updated as you add or remove chapters of your book and cannot be changed manually. The Kindle Interactive TOC (also called the NCX) is displayed in the Kindle menu and can be accessed from anywhere in the book. Readers expect to see a TOC page when paging through a book from the beginning. The Kindle Interactive TOC is an additional way for readers to navigate books. The inclusion of a Kindle Interactive TOC is important for books that are longer than 20 pages. You can allow Kindle Create to detect chapter titles during DOC(X) import or by selecting Edit > Chapter Detection. You can add a manual entry to the TOC by selecting the thumbnail in the Contents Pane and then choosing the Include in Table of Contents checkbox in the Properties Pane. Located next to the Save button, the Theme button lets you choose from pre-defined book styles. These styles have been created by professional book designers and produce a well-styled eBook that will be easy for your readers to enjoy. Select one of our themes to update your eBook appearance. Any element that you have marked in your eBook is updated to the style defined in the active theme. Modern theme is active by default. These themes cannot be edited by the user. Language note: If your DOC(X) file is in one of the supported Indic languages (Hindi, Tamil, Malayalam, Marathi, or Gujarati), Kindle Create only displays two themes: Classic and Modern. Book Title: Creates custom formatting for the book title on a new page and adds the book title page to the Kindle Interactive TOC. Book Subtitle: Adds custom formatting and positions descriptive text for the book part in relation to the book title. Author Name: Formats your name and places it relative to the book title on the title page. Part Subtitle: Adds custom formatting and positions descriptive text for the book part in relation to the part title. Page Title: Formats the title of the page. Used for sections such as preface, contents, list of illustrations, etc. First Paragraph: Removes the indent for the paragraph, but doesn't add drop cap. Dedication: Formats the header for your dedication page and adds it to the Kindle Interactive TOC. Opening Quote: Formats an opening quote for your book and places it on its own page. Opening Quote Credit: Formats the originator of your opening quote separately and distinctly from the opening quote. Copyright Text: Formats a paragraph of your copyright page. Confirm that all of your chapters were converted correctly. If there seem to be chapters missing in the Contents Pane, they are probably embedded in a previous chapter. Highlight the previous chapter and then scroll through the section in the Edit Pane to locate the buried chapter heading and tag it with the Chapter Title element. Use Chapter Title to add a font face and size, make an entry in the Kindle Interactive TOC, and add a page break so that the current chapter begins on a new screen. Use Chapter Subtitle to decorate and position descriptive text about the chapter below the chapter title. Use Chapter First Paragraph to remove any indent from the paragraph and add a drop cap whose appearance is set by the active Theme. Adjusting the drop cap coverage: In the Properties Pane, on the Formatting tab, the First Paragraph element applies a drop cap to the first character of a paragraph. If your first character is punctuation, such as a quotation mark, Kindle Create automatically extends the drop cap coverage to include the punctuation and the first letter. For other situations, you can use the Number of Characters control to extend the drop cap, if needed. Adding Separators, which are a decorative element that indicates a transition in the text. Using Block Quote to highlight long quotes that you want to distinguish from your narrative. Using Poem to improve the formatting and readability of poetry. Adjusting paragraph indents: You can tweak paragraph indents (both first line and margins) using the Indents controls. Adjusting the spacing between paragraphs: In Kindle Create, Elements apply to a single paragraph by default. You can apply the element to consecutive paragraphs and then use the Spacing controls to reduce or eliminate the top or bottom spacing to bring the adjacent paragraphs back together. Note: If you specify a font to identify your special text in Kindle Create, readers will not be able to change that font on Kindle devices and reading applications, so this feature should be used sparingly. Amazon encourages authors to use creative styles for headings, special paragraphs, footnotes, tables of contents, etc., but the majority of body text should be all defaults. The reason for this is that any styling on body text overrides the user's preferred default reading settings and users report this as a poor reading experience. If you have made so many changes that you can't figure out how to recover, clicking the Clear button returns your paragraph to plain body text so that you can start fresh. For eBooks imported from a DOC(X) file, you can edit the text in Kindle Create. The most frequent reasons are to correct typos and spacing issues. Tables, footnotes, lists, and inline images imported from your DOC(X) file cannot currently be edited in Kindle Create. Make any changes needed in the source file and then re-import it. If you have a lot of text to update, you can copy the text from a DOC(X) file and paste it in the Edit Pane. Pasted text takes on the formatting active at the cursor location in the Edit Pane. Copy and paste commands are available from the Edit menu or by shortcut: CTRL + C for Copy (CMD + C for Mac users), CTRL + V for Paste (CMD + V for Mac users). Kindle Create provides support for inserting, resizing, and deleting images. You can edit the size and alignment of your images with options based on professional book layouts. Kindle Create requires images in the JPG format and recommends at least 100 pixels on the longest side and 300 pixels per inch to ensure image clarity on Kindle HDX devices. Images inside a paragraph (inline images) can't be edited, but you can delete those images in the source and then insert them in Kindle Create. If you have issues, please contact us. Note: Using bleed on full-page images in a DOC(X) file is currently a pre-release feature. With Early Access, you can choose to try pre-release features and provide feedback. This feature is disabled by default. To enable, select Help > Settings > Early Access (Windows) or Kindle Create > Preferences > Early Access (Mac) and then check the Enable Beta Features box. Kindle Create restarts to complete the process. Right-click the location where you want to insert the JPG image and select Insert Image from the pop-up menu. The Insert Image window appears. Choose the image you want to add and click Open. Alt Text: Add a description of the image in Alt Text for visually-impaired users. If the image is purely decorative and does not add meaning, you can check the box to exclude it from the screen reader. Size: Select one of the display size options for your image. There are multiple options ranging from Small (33%) to Full (100%). By default, the image position is set to Place within margin. If you want the image to extend past the left and right margins, choose Place to edge. Note: At this time, choosing Place to edge means that customers can only read your book in portrait mode, which could frustrate some customers. We're working to fix this. When this issue is fixed, your book will automatically support reading in portrait and landscape. To replace an image, right-click the image and select Replace Image from the pop-up menu. If you need to change the Image Properties, see Adding Images for details on Alt Text, Size, and Position. To delete an image, right-click the image and choose Delete Image from the pop-up menu.